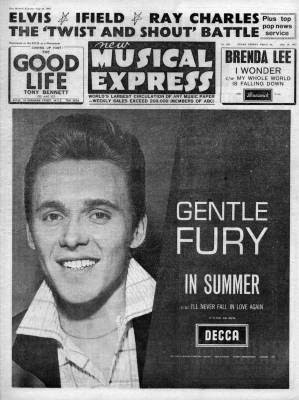 Entered the top 40 on 21 March 1964. Stayed in top 40 for nine weeks, reaching No.2 for four weeks. The Beatles had had one minor hit single in Love Me Do, and a massive number one hit single in it's follow up, Please Please Me. George Martin wanted to release an album as quickly as possible. Such was Martin's urgency that he called them in from their February 1963 tour with Helen Shapiro, and pressed ahead with making the record, despite the effect that a heavy cold was having on John Lennon's voice. They already had the A and B sides of the two singles, so they needed to record another 10 tracks to make up the 14 that was the standard number of tracks on a UK album at that time. Thus, at 10:00am on Monday 11th February 1963, the Beatles traipsed into Abbey Road Studio 2 to begin work on their début album. Nearly 13 hours later, they were done. George Martin: The first LP was recorded in one day. We needed to have things quickly. I was very concious about that with 'Please Please Me' being a number-one single. If I had an album to follow it very sharply, I would have a big album sale. I knew darn well we couldn't record an album of original songs. So the obvious thing to do was to record all the stuff they did in their live act. I'd already been to see them at the Cavern, so I knew their repertoire by this time. I just got them down to the studio and said, "Right, we're going to record 'Roll Over Beethoven,' we're going to record 'Money,' we're going to record 'Chains,' and so on. It was rather like a performance actually. We started at ten in the morning, no, eleven, in deference to their long beauty sleep, and I think we finished about ten at night. We a break for lunch and a break for tea and we recorded 10 songs. Norman Smith was at the controls, and he got a good balance. It was knocked off like a live performance. Martin's recollections are obviously a little hazy: The Beatles did not record either Roll Over Beethoven or Money on that day, although both tracks appeared on their second album. Studio documentation shows that the session did indeed begin at 10:00am. Studio documentation also shows that they recorded 11 songs. In addition to Martin, Smith and The Beatles themselves, journalist and fellow Liverpudlian Alan Smith was also present. He had been invited to cover the session for the NME, and wrote about it in the 17 July 1963 edition, in an article entitled The 'Twist And Shout' Battle Hots Up! (And How The NME Helped). They had recorded two songs in the morning, rehearsed through their lunch hour, and recorded another three songs in the afternoon. The evening session began with The Beatles attempting to record the final Lennon / McCartney original of the session, Paul McCartney's Hold Me Tight. I can't remember much about that one. Certain songs were just 'work' songs, you haven't got much memory of them. That's one of them... I remember the name of the tune. Some of them... I wouldn't call them fillers but they were 'work' songs. You just knew that you had a song that would work, a good melody. 'Hold Me Tight' never really had that much of an effect on me. Of the 13 takes of Hold Me Tight recorded by The Beatles, only takes 6 and 9 were complete, and neither of them were performed satisfactorily. Nevertheless, it was decided that takes 9 and 13 could be edited together to create a master version, but this was never done. By 10:00pm, The Beatles had rattled through four more tracks and fulfilled their quota for 10 songs. But by then, someone - probably George Martin - had decided that Hold Me Tight wasn't up to scratch and asked for a replacement. So they took a break, and The Beatles, George Martin, Norman Smith and Alan Smith went down to the Abbey Road canteen for refreshments, and discussed what the final song might be. At about 10pm we all retired to the studio canteen for coffee and biscuits, where the Beatles and recording manager George Martin began an earnest discussion about a suitable number for the last track. A lot of material was considered, but there were some friendly arguments about a final choice. 'Twist And Shout' — a number I'd heard them do on a radio programme a few days before — hadn't been mentioned. "What about 'Twist And Shout'?" I asked group member George Harrison, who was sitting nearby. "I heard it on the radio the other day and it was pretty good." "That's an idea!" said George. He mentioned it to Paul, John and Ringo. They nodded in agreement. "Make it nice and loud!" shouted someone over the canteen noise of cups and saucers. Well, off they went back to the studio — and recorded it in two takes! The radio broadcast that Smith remembered was The Talent Spot, recorded Tuesday 27 November 1962 and broadcast at 5:00pm on Tuesday 4 December 1962, just a day short of 10 weeks previously to the recording session (not quite the "few days" that Smith mentioned in his article). The Beatles had performed Love Me Do, P.S. I Love You and Twist and Shout. They were sitting in a little room to the side of the studio, and they said "What are we going to do for the last number?" And I said "I thought I heard you guys do 'La Bamba' a few weeks ago on the radio?". And Paul McCartney looked a bit blank, and he said, "No, you mean 'Twist and Shout'". So they said "Alright, let's go and do it", and they just went and did it. And I looked down from the control room, and John Lennon did it. He wasn't well - he had a really bad cold, and he was drinking milk and having throat sweets, and just did it in one glorious take. Norman Smith also remembered the occasion. "Someone suggested they do 'Twist and Shout', the old Isley Brothers' number, with John taking the lead vocal. But by this time all their throats were tired and sore - it was 12 hours since we had started working. John's, in particular, was almost completely gone so we really had to get it right first time, the Beatles on the studio floor and us in the control room. John sucked a couple more Zubes, had a bit of a gargle with milk and away we went." 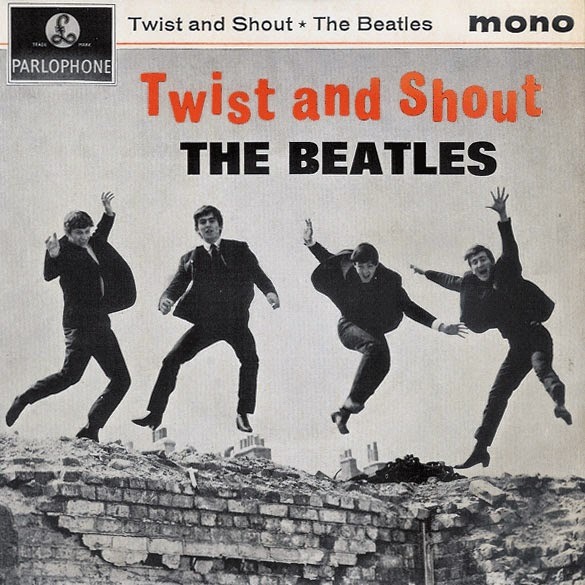 The original Top Notes version of Twist and Shout, produced by Phil Spector. Twist and Shout was written by Phil Medley and Bert Russell, a pseudonym for songwriter Bert Berns. It was originally released in America in August 1961 by the Top Notes on the Atlantic label (45-2115), produced by a little known producer named Phil Spector. The single did not chart. Berns felt that Spector had failed to capture the energy generated by the Top Notes' live performances, and decided to make a new recording of the song, with himself producing. The new version, released in the UK by the Cincinnati group, The Isley Brothers in July 1962 on the StateSide label (SS 112), reached the lofty position of number 42 on the UK chart. In Revolution in the Head , critic Ian MacDonald says of the Isley Brothers version "the bass is looser and the conception more spontaneously chaotic, with saxes and trumpets joining in on what is basically a party record with Latin overtones". The Isley Brothers version of Twist and Shout, produced by songwriter Bert Berns. Despite it's low chart placing, The Isley Brothers version of Twist and Shout attracted the attention of The Beatles, who were always on the lookout for obscure records to add to their act - this was their way of setting themselves apart from the other bands that vied for audience attention at the Cavern and in Hamburg. It was added to their act around August 1962. But where the Isleys had created a party record for American high school proms, the Beatles turned it into something far more feral - a record for late nights in Liverpool's sweat dripping Cavern and the strip clubs of the Hamburg Reeperbahn. Where the Isley Brothers version twisted at the hip, The Beatles twisted very firmly at the groin. "The exciting Beatles" rock group quite frankly failed to excite me. The drummer apparently thought that his job was to lead, not to provide rhythm. He made far too much noise and in their final number "Twist and Shout" it sounded as though everyone was trying to make more noise than the others. In a more mellow mood, their "A Taste of Honey" was much better and "Love Me Do" was tolerable. So in Abbey Road Studio Two, with Lennon stripped to the waist, and with the others treating the control room staff as their audience, The Beatles went for it.The song was completed in one take. As Alan Smith said in his NME article, a second take was made, but Lennon had given his all, and though the performance was complete, his voice had gone. Lennon's performance is arguably one of the most stunning rock and roll achievements of all time. In the control room, Martin, the two Smiths and Langham were stunned. Going by McCartney's triumphant "Hey" at the end, The Beatles perhaps surprised even themselves. So it seems that Twist and Shout, one of the all time great recordings, might not have happened at all if The Beatles had been able to nail Hold Me Tight - certainly one of the lesser songs in the Lennon/McCartney canon.